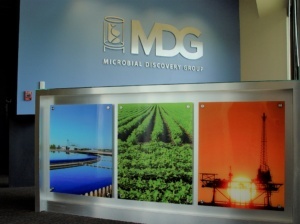 Microbial Discovery Group (MDG) delivers more than just innovation. We are a full service manufacturing facility. Owning the entire product development process, from discovery to scale-up, we have the capabilities to customize to fit your needs. Located near Milwaukee, Wisconsin, we are committed to delivering high quality Bacillus based products. We believe we succeed where results are measured and that our products deliver on that along with our ongoing educational tools and programs.